Sometimes the most dangerous thing that can happen to a person is for them to get what they wish for. 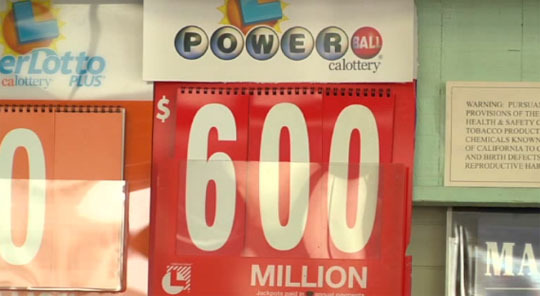 Every time I start seeing news stories about “Powerball fever” or a run on gas stations when lottery jackpots explode, I can’t help but think of Tim Burton’s Batman. 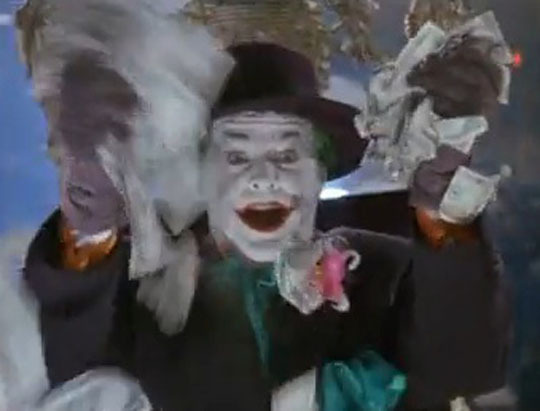 In it, Gotham’s population lunges for cash as The Joker throws out bills to them from on high, stuffing the paper in their pockets and crawling on all fores to claw in as much as possible. Then, the poison gas hits. There is a big difference between a “what the heck, why not” lottery ticket purchase and one bought where the person essentially fantasizes about how “all my problems would be solved” with a winning draw. Whether it is the at a federal, state, community or individual level, all too often people look at dollar signs as the ticket to happiness or fulfillment, when it is not. More often than not, the lust for money only serves to mask or exacerbate existing problems. And when anyone dares to point out that it is our emotional weaknesses and spiritual bankruptcy that is more likely the root of our financial ills and cultural unhappiness, the citizens of Gotham get defensive. Barring some sort of medical problem or environmental disaster, the vast majority of people who are so hopeless that they see a lotto ticket as “a way out” of their financial predicament need emotional and spiritual currency — not money. When I was in high school I was a cross country runner. Sometimes, on an eight mile run I’d pass a casino and I’d see extremely poor people walking inside, in all likelihood to spend what little cash they had, hoping they’d hit a big jackpot. Today I live in Maryland, where politicians — both Republican and Democrat — have pushed casinos as a form of economic stimulus. Question: Does Maryland want an economy built around Blackjack dealers and zombies who pull on slot machines, or does it want an economy built around science and art and engineering? That question has already been answered, and sadly the zombie-backers have won out. The people who promote lotteries as a way to fund education are like plumbers who fix your leaky faucet by diverting water to flood your basement. The people who promote casinos as a the ticket to long-term economic growth are like high school guidance counselors who would tell a student to consider dropping out and getting a GED sometime down the road. We constantly mislead people, and then when they go down dangerous paths that with disastrous results, we blame this guy or that guy or anyone else within our line of sight. Instead of running out to the grocery store to buy a lotto ticket when the payday hits 700 million dollars, I suggest using that 30 minutes to sit down in solitude and work towards figuring out what will make you happy at the deepest of levels. When you figure it out you’ll realize that such knowledge is worth more than any joker could ever put in your bank account. Play JIm Zee’s Lottery: Every ticket is a winner. You give me one dollar, and I’ll give you back fifty cents. Excellent suggestion at the end there. Sad about MD. Our family is about to relocate there from MA, awful to ??? Urg. Turn back while there’s still time! I’m not really kidding… If you can get into Virginia instead, that’s a better choice. Too late. Come on now, is it really that bad? Can’t be much worse than Mass. Not sure about Mass., but if there was any possibility of picking Va. over Md. I’d go with it. What makes me happy? My fiancée, family and friends. I could quite happily live hand to mouth as long as I have these people in my life. Well said, James. Family, friends and loved ones (and love in general) are all that matters. I know that sounds cheesy, but it’s true. If I were to win the lottery (which is unlikely) or if I became rich, I would seriously consider moving to a state with no income tax (and there are seven of those to choose from). My parents have said they would do the same thing if they became rich or won the lottery… my dad in particular has expressed interest in moving away from MN in the past, largely because of how the culture here has changed, and not for the better (I tend to agree with him), especially when we have a governor who is in the process of raising taxes and a Democrat-controlled legislature that ignores the will of the people and is even trying to force people who leave the state to pay a “snowbird tax.” Ugh. Not to mention, my folks and I could benefit from physical and psychological distance from some of our relatives.